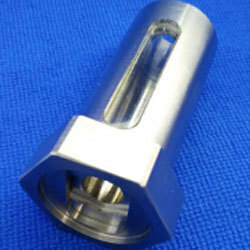 We the manufacturer and suppliers of tungsten alloys and related products are offering highly efficient PET Syringe Shield 3cc. This range of PET shield is manufactured by using advanced range of tungsten alloy along with PET. This type of radiation shield is available in the dimensions 2.9" l (74 mm), along with the shielding of 34" tungsten (9 mm). This compact in size Syringe Shield of weight 1.7 lb (.77 kg) with the Gaard Lock Syringe Shield, 3 cc can be ordered by our esteemed clients at reasonable market prices.